Truck is a 78 351m 4 speed 4x4 Finally got a mechanics vacuum gauge. from Harbor Freight to see how well my truck runs. wanted to make sure I was useing it properly. I hooked the vacuum gauge to the vacuum tree behind the carb. I got a fairly steady 18 and was holding vacuum steady at 2500 rpm. thats want an engine in good condition should be doing right. Looks good. Yepper, should be a rock steady needle somewhere between 18" to 20" at sea level. "Fairly steady" though isn't what we want, might mean a misadjusted carburetor, or might be something more serious if bad enough. What's it doing? Study the vacuum gauge charts, there are a gazillion different things they will show. Make sure the correct Power Valve (economiser) is selected. 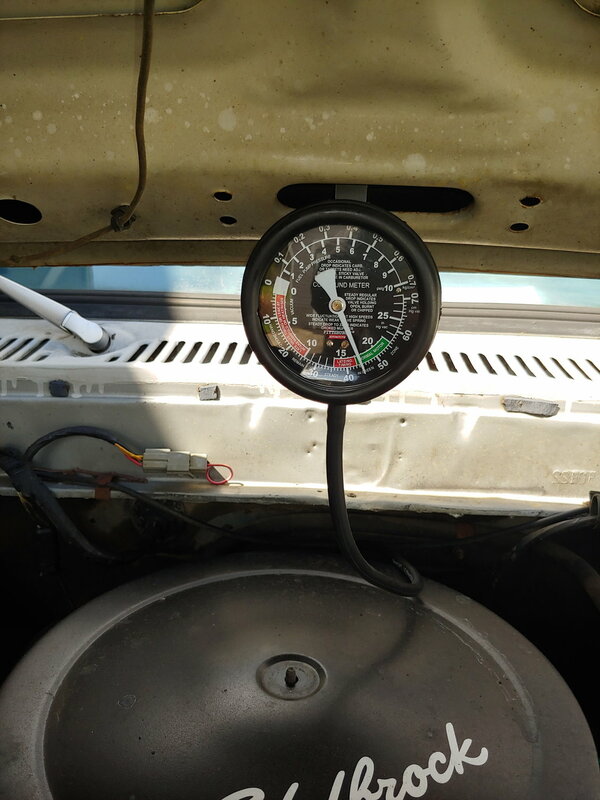 Your vacuum gauge is a good check on this, run it into the cabin so you can keep an eye on the vacuum in different situations, particularly steady cruising on level ground. If the average cruise manifold vacuum falls below the PV opening point it will really waste some gas. You'll have to play with jetting to get top efficiency and economy. If you've done only mostly city driving than 5 isn't unbelievable. I only get about 7.5 city driving with a 460 engine (about 10 or so highway).